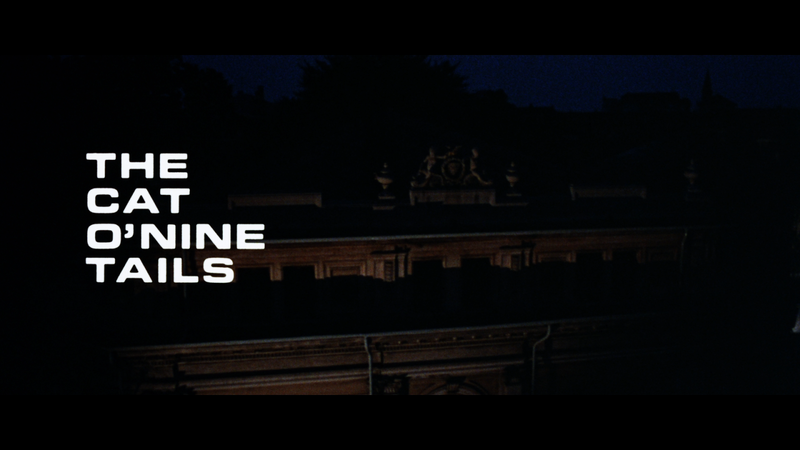 Cat O' Nine Tails is Dario Argento's second feature film as a director. Does he hit another home run or does the dreaded "Sophmore Slump" get the better of him? The special features Arrow has put together are numerous, but a little bit underwhelming. 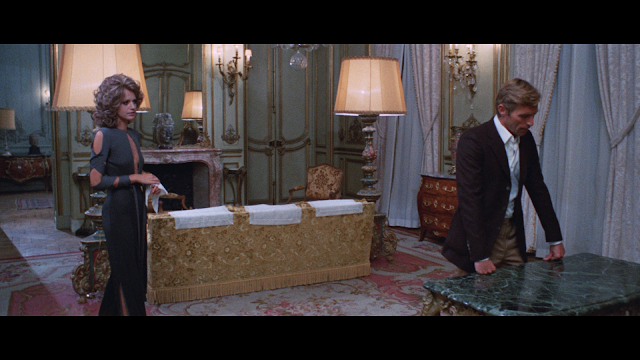 I loved the commentary track with Jones and Newman. They gave me a new look at the film while giving us a play by play on the locations, actors, etc. 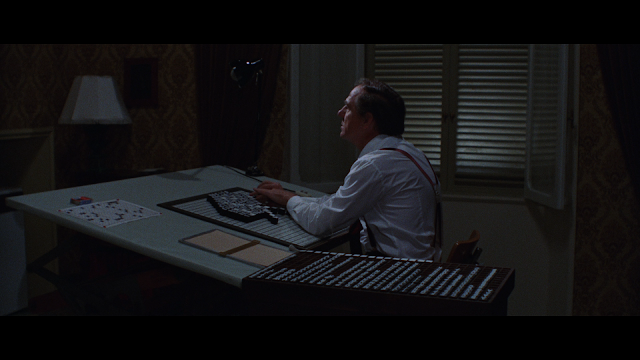 The interview with Dario Argento is ok. Seems like he is just going through the motions and that he really doesn’t want to talk about the film. The other interviews are a bit more lively, but the whole affair seems to be a bit lacking. I was hoping for some critical analysis of the film or a look at some of the film’s themes, but outside of the commentary track, there is nothing of that sort here. It’s a shame because I think that this would the film that really needed some more outside perspective. Still, the features are good, but I wanted more. PLEASE NOTE: There is an authoring error where the Child Star interview doesn't link to the right interview. It links to the previous interview with the film's co-writer. 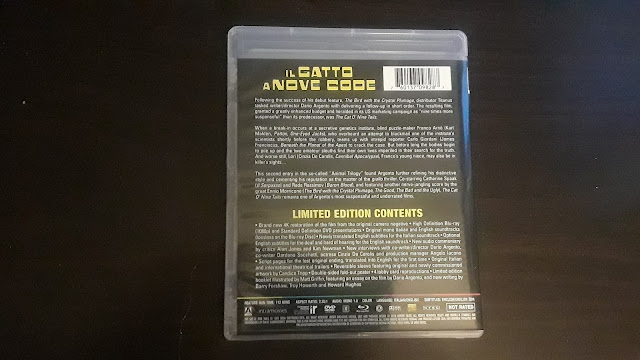 Arrow knows about this error and has delayed the blu-ray release until the end of January 2018 to fix the error before it hits store shelves. [UPDATE] The authoring error has been fixed in its current retail form. You can buy with ease of mind now. As this was a review copy sent to me I can not review the packaging. I can tell you that it will be the same type of packaging that Arrow has been using for the Limited Editions, which is a nice sturdy box, amary case, poster, and booklet. The artwork is being done by the very talented artist Candace Tripp, who did the artwork for Donnie Darko, The Bird with the Crystal Plumage, and the U.K. release of Phenomena. 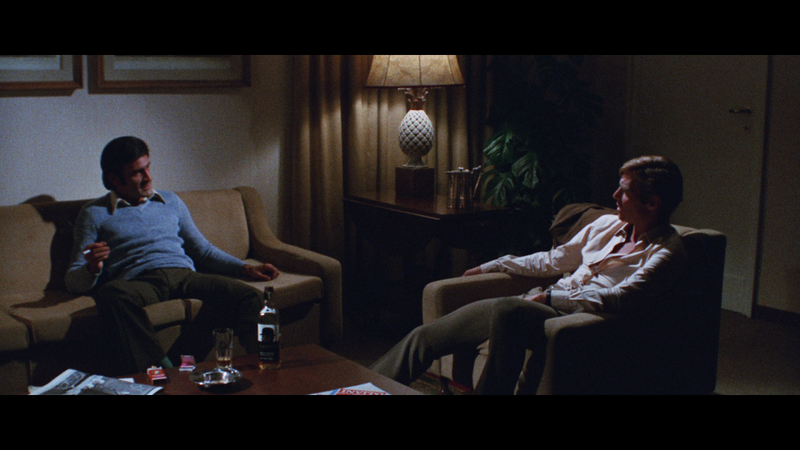 Arrow has done a 4K restoration for this release and it looks amazing. Colors are vibrant and true as are skin tones. There is no black crush found here (a lot of the film takes place at night or in the dark) and there is a thin layer of grain. There are already some, who have seen screenshots from this release, that will say it is a bit too dark, but I didn’t find it like that at all. 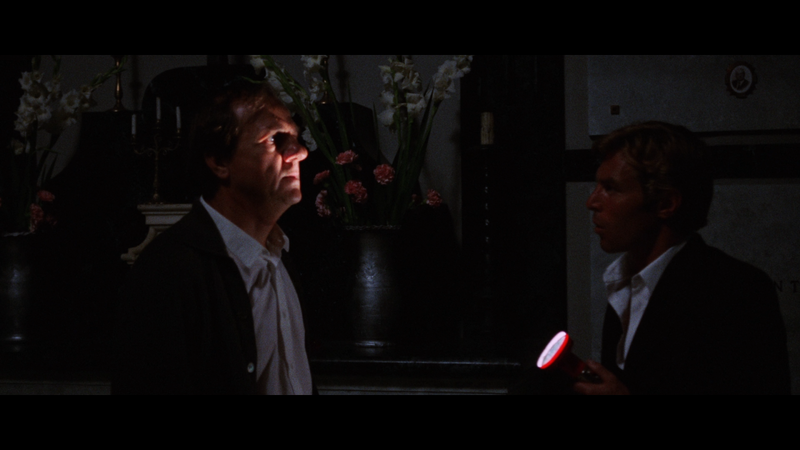 Watch Scream Factory’s Hell Night release and come back and talk to me about what “dark” looks like. English and Italian Mono DTS-HD Master Audio tracks are provided here and the English wins out, hands down. The English track is more robust and healthier sounding. Ennio Morricone’s score shines here as well. The Italian track sounds softer and more hollow. I doubt that the Italian track was remastered at all. Listen to the English track. 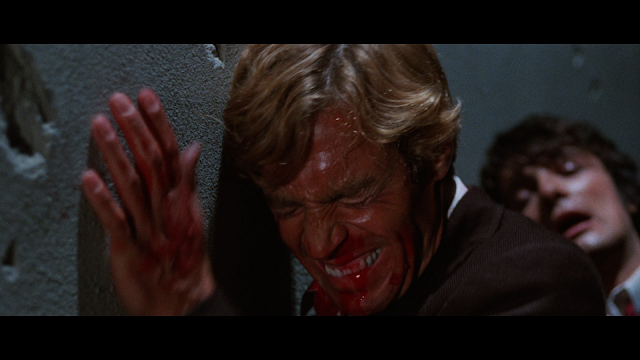 Cat O’ Nine Tails is a film that is frustrating to watch. On one hand, we have the very capable Dario Argento directing and co-writing the film and he brings back most of the team that he had for his debut, The Bird with the Crystal Plumage, including Ennio Morricone provided the score. You would think that everything would be in place for a great film, one on par or exceeding the already high bar that was set with Bird. If you were the judge the success of the film by the first 20-30 minutes, then you would have been correct. 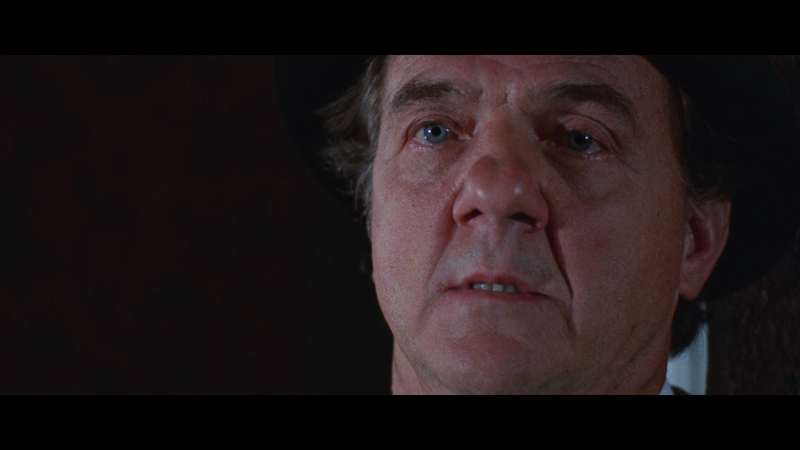 The film starts out with a blind man (Karl Malden) walking with a little girl. They pass by two men sitting inside of a car and Malden knows that something is up. Before long, he has kind of witnessed a murder (he heard it) and has inserted himself into the investigation when another man is pushed in front of a moving train. 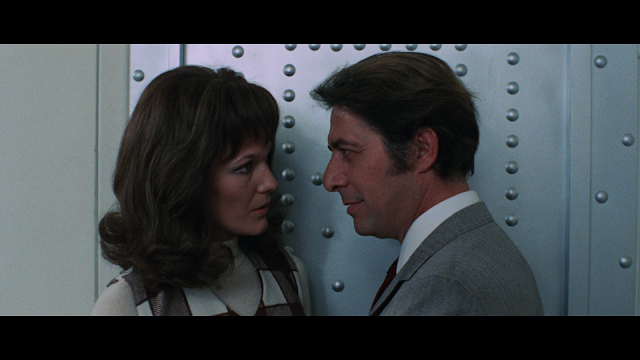 These first 20-30 minutes are not as exciting as Bird nor are they as terrifying as the opening to Suspiria. They do the job of setting the film up and do it really well. I was excited to see where this film was going. 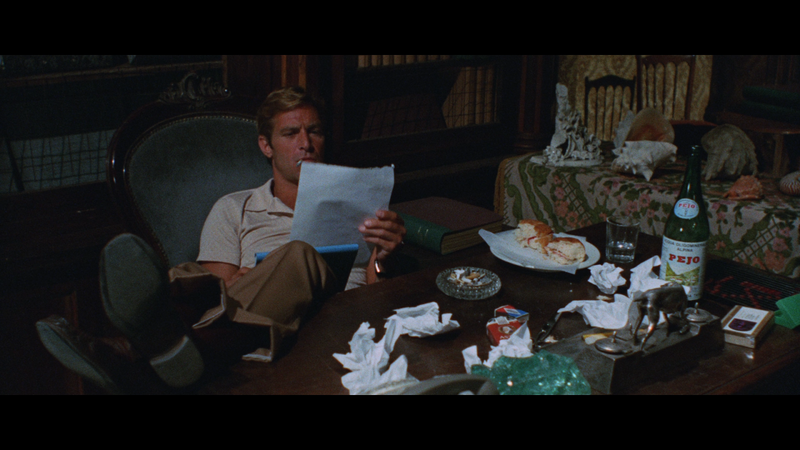 Then the middle of the film starts to eat away at any good graces the opening gave this film. We have to watch the news reporter as he tries to figure out who is doing the killings, only to have Malden come in and one-up him. I loved when Malden would do this, but it was becoming really tedious as it seemed that the news reporter wasn’t really needed for anything other than his sight. Malden’s character is a fully realized character and he has been able to use his blindness as a plus instead of a crutch. 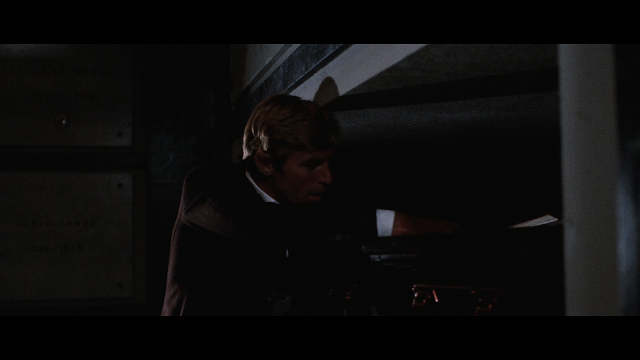 Luckily the last third of the film picks up with a mad chase to get to the girl that Malden takes care, who has been kidnapped. This is one of the only times where the news reporter actually does something that leads to somewhere. He finds out that the killer is on the roof and tracks him down. When the killer’s identity is revealed, all I could think of was “Of course it was that person.” The killer is very obvious from the moment they are introduced. Cat O’ Nine Tails does have some good things going for it. The acting by everyone is good, even the kid actor is good and never once annoying. Malden is great as the blind man who can still investigate better than the real investigators. The actor who plays the news reporter is good, but he really has nothing to do, so he is teamed up with Malden a lot. 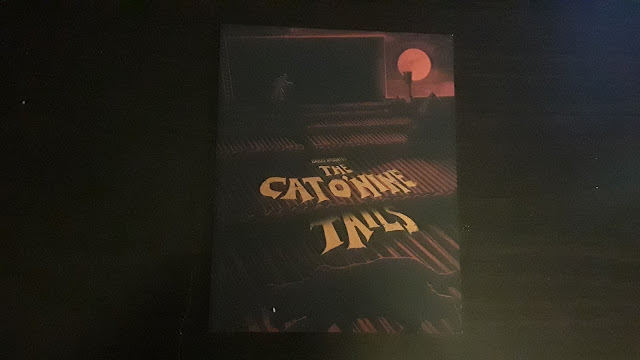 The film looks great too. 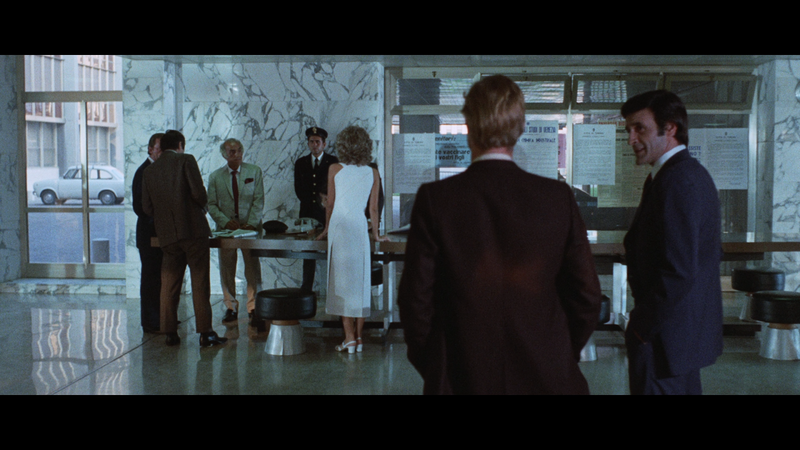 Argento and his DP capture Turin beautifully. That is one thing about Argento films: they always look great, and even though Argento didn’t have his usual DP, who was working on another film, this film’s DP does an excellent job of creating mood and atmosphere. 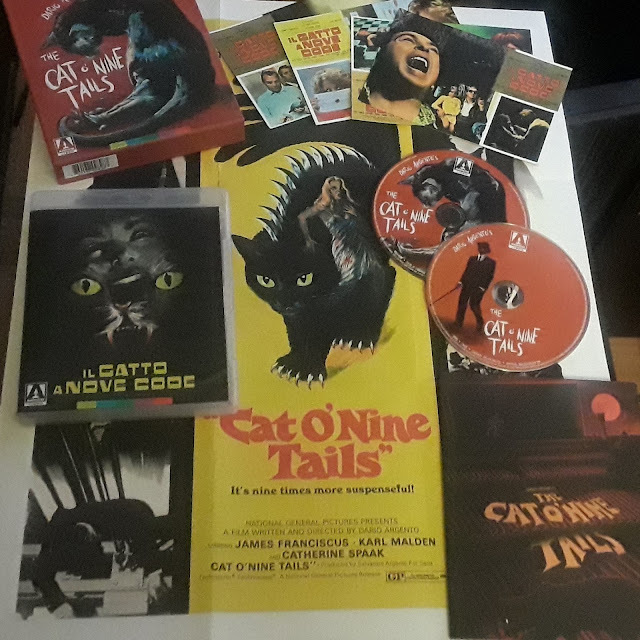 Argento considers Cat O’ Nine Tails to be his worst film and I have to agree (as of this review). 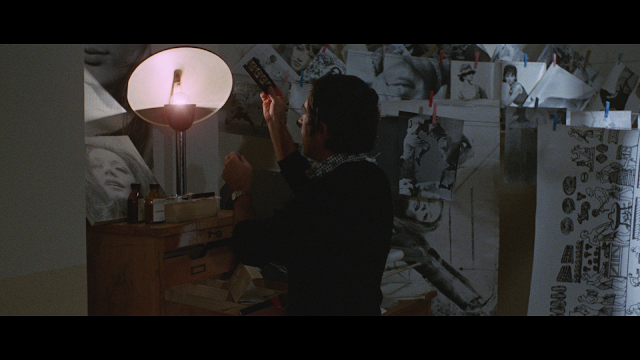 The film is a pale imitation of The Bird with the Crystal Plumage and does nothing to advance Argento’s vision. You can tell that he made the film, but you can also tell that his heart really wasn’t in it. There are good things to find in the film, but the film takes way too long to get to a conclusion that could have come fifteen or twenty minutes earlier. This is the first Argento film that I have seen that I didn’t like. That saddens me, but also brings me hope because maybe I am getting some of the bad ones out of the way of the good ones that I haven’t seen yet. Cat O'Nine Tails is not all that great of a film. 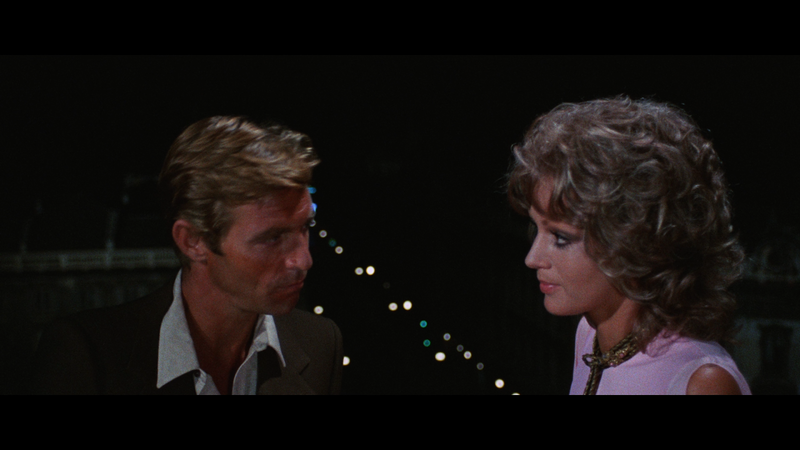 It does contain things in it that are good: the performances, Argento's direction, Ennio Morricone's score, but the film just didn't do anything for me. 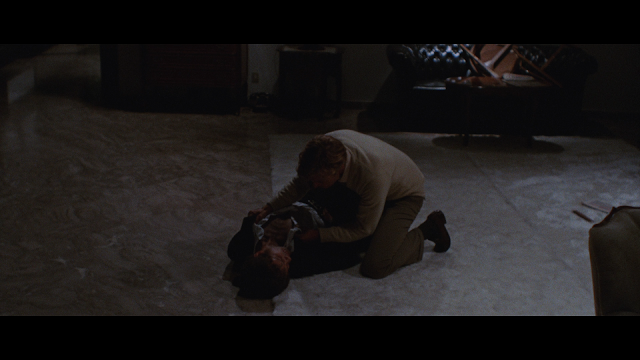 I thought that the film started off strong (like most Argento films do) only to have to it peter off as time went on. As the film was drawing to a close, I found myself not really caring about what happened. Of the Argento films that I have seen, this is by far the worst. The blu-ray, from Arrow, is a mixed bag. 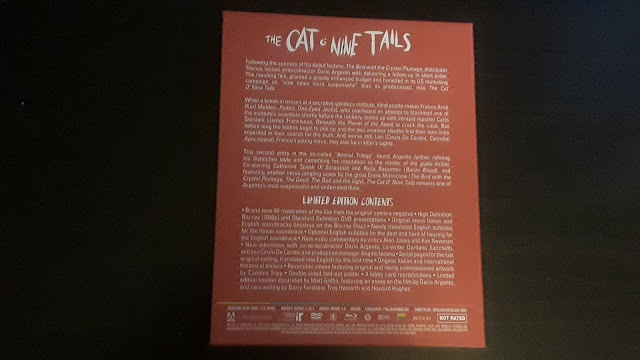 The picture and audio are great, but the special features package leaves much to be desired. While we do get interviews with some who worked on the film, there is no film analysis from critics outside of the commentary track. 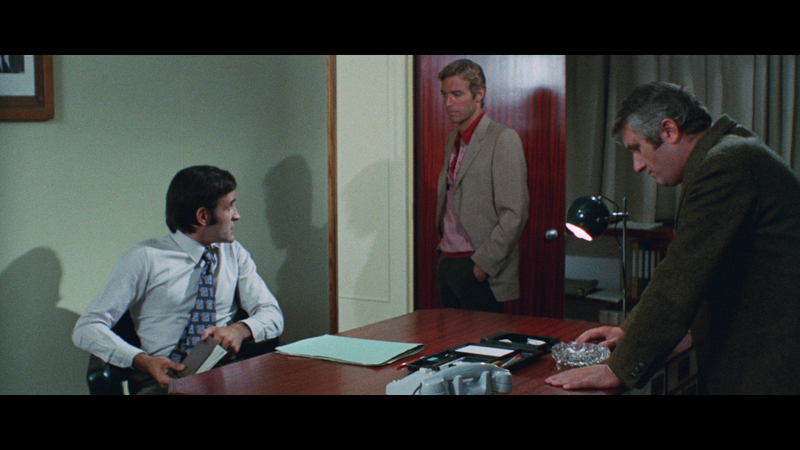 Arrow alsways includes these and the absence of them is shame because I think that this film needed them. All in all this isn't a bad release, just a disappointing one. 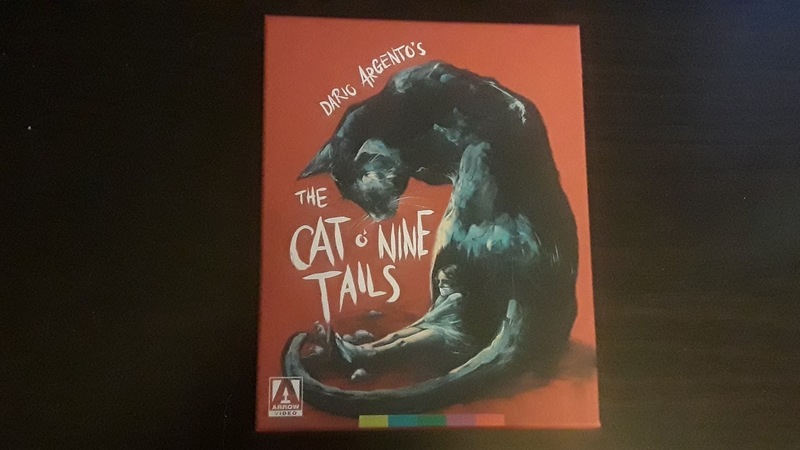 I would recommend this to those who are already fans of Argento or are trying to watch all of his films. CHECK OUT PAGE 2 FOR MORE SCREENSHOTS!!! BEWARE, SCREENSHOTS MAY CONTAIN SPOILERS! !